In a busy world of noise, how do you get your message across? Everyone knows how vital good communication is in any business. But what’s the point if no-one’s listening to you? 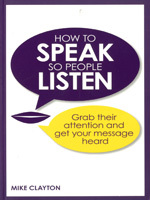 Effective tools, strategies, tips and tricks will make sure you’re able to command attention and know that, whenever you speak, people will want to hear what you have to say. Who else needs to speak so people listen?